High Vale Orchard is Western Australia's Big Apple for organic fruit. Set on a stunning property in the Perth Hills and only 35 minutes from the CBD, High Vale (born 1939) offers the finest fruit, the most delicious 'Inner Core' juices and Core Cidedrs that are attracting the attention of the most serious cider aficionados. With a backdrop of rolling orchards and state forest, come and unwind at The Core Cider House, a totally unique setting that is rustic yet refined and always warm and inviting. Sample our ciders on tap, sample our preserves, or just enjoy a great coffee, house-made cakes and tasting plates full of our delicious fare. We are open Friday to Sunday from 10am until 4.30pm. High Vale offers the best wholesale prices for bulk fresh organic fruit, produced as mother nature intended - with no chemical residues. The Core Cider House is a superb function venue, either for corporate functions or private. The Dragonfly Ponds, apple avenues and the ambience of the orchard create a beautiful atmosphere for special ceremonies and the Cider House for intimate receptions. Orchard tours are available during the week. 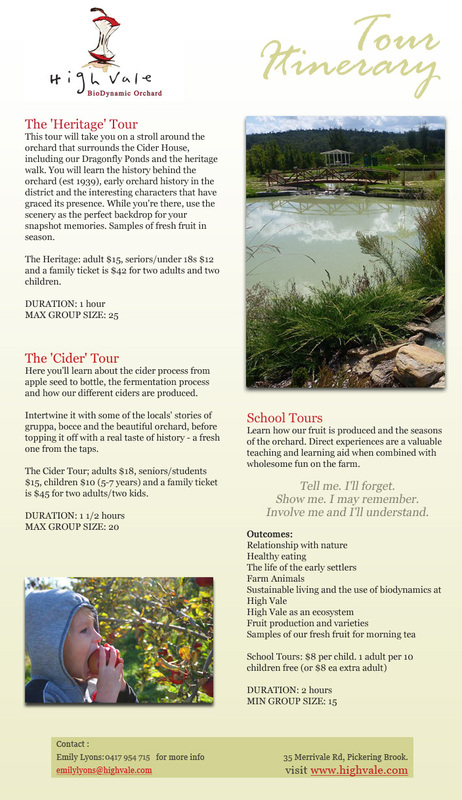 We offer three tours: The 'Heritage', The 'Cider' and The 'School' tours. Enjoy the fruits of our labour, experience and passion. Made with fruit from our orchard and with water tested for its purity, the flavours that are missed in mass produced ciders are bought to the fore. Character assured, perfectly refreshing and perfectly suited to the Aussie lifestyle. The ingredients are better, the attention to detail is better, the cider is better. And proudly West Australian grown, pressed and produced. Traditional Apple & Pear: 6.5% ald/vol. 'Dry'. Bottle conditioned (not artifically carbonated), no preservatives. Long lasting fruit finish. Traditional Pear (perry): 5.7% alc/vol. Champagne style. Bottle conditioned, no preservatives. Refreshing mouth finish. Sparkling Apple: 5% alc/vol. 'Sweet'. Carbonated. Refreshingly dangerous! Pure sunshine from WA. Grown, squeezed and produced on the orchard, Bottled in glass (it just tastes better in glass!) NOT reconstituted (you'd be amazed how many juices are). No preservatives - we use the humble lemon. Actually Inner Core is the ONLY certified organic juice produced in WA. Apple & Pear: combines the sweetness of tree-ripened pears with our apples and with a twist of lemon. Pink Lady Apple: So popular we ran out of this one. The next batch coming soon with the forthcoming harvest of pink lady apples.